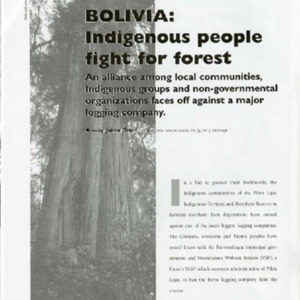 Bolivia: Indigenous People Fight for Forest, An alliance among local communities, Indigenous groups and non-governmental organizations faces off against a major logging company. The Indigenous communities of the Pilon Lajas Indigenous Territory and Biosphere Reserve have challenged a large logging company, asking for their overthrow. They claim that logging causes negative environmental, health, ad social effects.